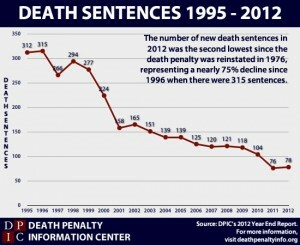 Death sentences from 1995-2012. Graphic courtesy of the Death Penalty Information Center. Many states, even if not fully abolishing the death penalty, seem to be gradually opting out. Here are seven significant signs that American capital punishment continued its slow, but by no means uniform, decline in 2012. State Repeal Efforts – Connecticut became the 17th state to abolish the death penalty when Governor Malloy signed a repeal bill on April 25. And even though California voted no on Proposition 34, which would have abolished that state’s death penalty, the vote was close, indicating that repeal in California still has a promising future. Clemencies In Cases Involving Mental Disability – In Ohio, the execution of Abdul Awkal was stayed in June by Governor John Kasich due to Awkal’s long history of severe mental illness. One month later, Governor Kasich also granted clemency to John Jeffrey Eley, citing Eley’s limited mental capacity as a reason. Meanwhile in Georgia, Warren Hill received a stay 90 minutes before his scheduled execution, though not on the grounds of his clear “mental retardation,” but because of a lethal injection technicality. But while some authorities granted relief to prisoners with mental disabilities, no such thoughtfulness was evident in Texas, where Marvin Wilson was executed in August despite having an IQ of 61. And John Errol Ferguson is still at risk of being executed in Florida despite his diagnosis of paranoid schizophrenia and his delusional belief that he is the “Prince of God”. Clemencies In Cases Involving Terrible Childhood Abuse – In January, Robert Gattis, whose petition cited longtime sexual and physical abuse by family members, was granted clemency in Delaware. But in other states, executions of prisoners were carried out despite evidence of similarly traumatic childhoods. Sammy Lopez grew up in a “horrifically violent home” and suffered “significant neurological impairments” yet was executed in Arizona in June. In the same month, Michael Brawner was executed in Mississippi despite having been diagnosed with PTSD and bi-polar disorder, stemming from the frequent and severe abuse he suffered throughout his childhood. Daniel Cook suffered extreme sexual, physical and emotional abuse by family members and group home leaders, and was diagnosed with various mental disorders, from schizophrenia to acute psychosis. Despite the mitigating circumstances of Cook’s abusive upbringing, he was executed by the state of Arizona in August. No Executions In Georgia (or Alabama, or Louisiana, or Missouri) – On September 21, the anniversary of Troy Davis’ execution reminded us of that low point when the Peach State put a man to death despite serious doubts about his guilt. But Georgia has not executed a single inmate since then and in April issued a rare grant of clemency to Daniel Greene, on the basis of his remorse and model behavior in prison. No Death Sentences In North Carolina (or South Carolina, or Virginia) – This year, for the first time since 1977, North Carolina did not hand down a single death sentence. 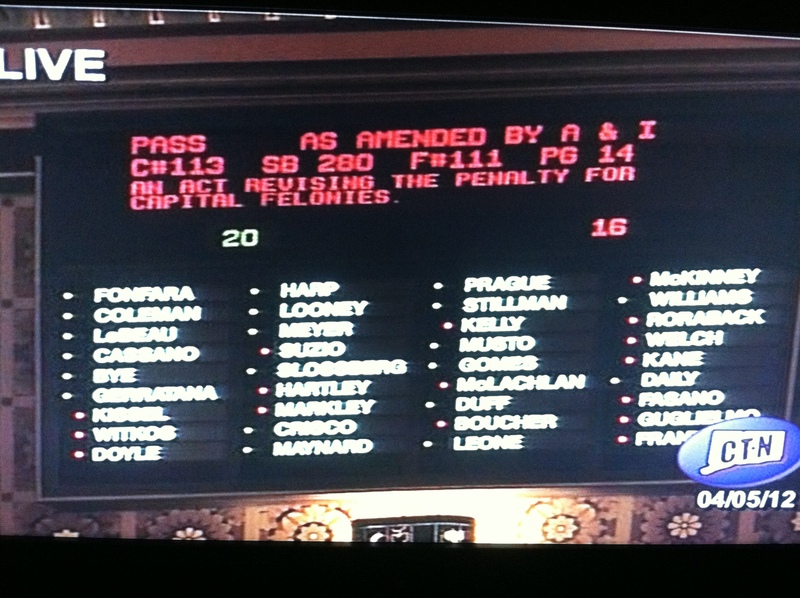 The state did take a step backwards by gutting the Racial Justice Act – a law designed to expose racial bias in capital cases. But the law is still alive, and just this month a North Carolina judge commuted three death sentences based on such demonstrated racial bias. Texas: Few Death Sentences, But More Racial Disparities – 2012 saw only nine people sentenced to death in Texas. Yet eight of the nine were people of color. (In fact, over the last five years, nearly three-fourths of those sentenced to death in Texas has been people of color.) Also, nearly 75% of those executed in Texas in 2012 (11 out of 15) were people of color. As Texas’ use of the death penalty shrinks, is more racial bias being exposed? Public Support Declines, But U.S. Position As Global Outlier Remains – In May, a Gallup “values and beliefs” survey found that only 58% of respondents said the death penalty was morally acceptable, down from 65% last year. Yet, the U.S. has once again joined North Korea, China, Syria, and 35 other countries in opposing the UN General Assembly’s non-binding resolution calling for a global moratorium on executions. It is clear that in 2012 the United States of America continued to be extremely conflicted about the death penalty. Its use and its support are diminishing, in some places more than others. And as we wrestle with the bigger question of our culture of violence, it is likely that we will see more state repeals, more clemencies, and in general more evidence that the death penalty’s time is coming to an end. This entry was posted in Death Penalty, Prisoners and People at Risk, USA and tagged abolish the death penalty, California, Child Abuse, connecticut, death penalty, death sentences, georgia, mental illness, mental retardation, mentally disabled, moratorium, north carolina, public opinion, racial disparity, Racial Justice Act, Texas, Violence by Brian Evans. Bookmark the permalink. It is clear that support for the death penalty is in severe decline. With these results we urged to no let up on our struggle to put an end to the death penalty. With the tragedies in Newtown we are living in a culture of violence. We need to end this culture of violence and State violence. Turning to crime is often a mental thing borne out of either need or a genuine condition. To prevent the emergence of crooks, it's these psychiatric problems that have to be identified and taken care of before they grow out of control. Small steps are being made in the right direction. I hope people will come to understand that the death penalty is wrong. Small steps, but important ones! I can't wait till we can celebrate a world with no capital punishment!